Music at PLC is active and dynamic, supporting students to experience, perform and explore their musical potential. Students can connect and contribute to the PLC community through their involvement in this creative environment. 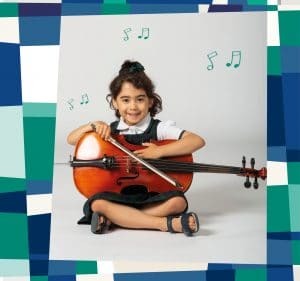 All students in Pre-Kindergarten to Year 8 receive a class music education, with the opportunity to elect further study throughout Years 9 to 12. A unique feature of the Curriculum Music programme is that daily class music is provided to all students from Pre-Kindergarten to Year 2. The Curriculum Music programme is sequential, active, holistic, and includes the study of music performance, improvisation, composition, music theory and aural skill development. Students are actively engaged in singing and performing repertoires from a variety of musical styles and genres. PLC is proud to be the only school in Western Australia with qualified and experienced Kodály-inspired practitioners teaching classroom music at all levels. This ensures that learning music is a joyful experience, involving a range of practical and theoretical activities that sequentially develop the skills, knowledge and understanding for all students to achieve at the highest level. Through the Co-curricular Music programme, students gain confidence and develop skills that allow them express their creatively and explore their musical potential. The Music Department administers over 700 music lessons a week to students from Pre-Kindergarten to Year 12. The School employs over 30 experienced and professional music teachers who provide specialist instruction in a wide range of instruments. Students are engaged through a broad programme of school and external performance opportunities and are supported in completing formal assessments through the School’s Internal Assessment Programme and external examination bodies. PLC recognises current research confirming that formal practical music education delivered to young children significantly supports their cognitive development, including the areas of literacy and numeracy. Violin, Viola, Cello, Double Bass, Harp, Piano, Guitar (Electric and Acoustic), Bass Guitar, Flute, Oboe, Bassoon, Clarinet, Saxophone, Horn, Trumpet, Trombone, Baritone, Euphonium, Tuba, Percussion, Drum Set, Voice (Classical and Music Theatre), Theory, Bagpipes, Pipe Drums, Composition. Our students connect to the world through music where they experience an international and varied curriculum and a wide range of performance opportunities. Reflecting the School’s cultural heritage, an acclaimed Pipe Band programme is offered allowing students to participate in the only all-girls’ school pipe band in Western Australia. They, along with other senior ensembles including choirs, bands and orchestras, hold an enviable reputation both locally and on the international stage.